Preventative dentistry is the practice of caring for your teeth to keep them healthy and beautiful for years to come. It is oral care that involves education, treatment, and practice of maintain your teeth and gums. 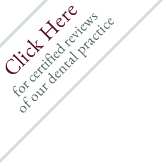 The benefits of preventative dentistry are endless. This facet of dentistry helps you avoid cavities, gum disease, enamel wear, and so much more. Good preventative dentistry not only reduces your risk for oral and overall health issues, but can save you time and money as well thanks to eliminating the need for serious dental treatments. There are many forms of preventative dentistry, such as daily brushing, flossing, mouthwash, dental x-ray, and bi-annual dental cleanings and checkups. If you are interested in learning more about preventive dentistry or would like to schedule a dental cleaning and checkup, we can help. All of our professionals maintain the highest levels of accreditation and pursue ongoing education to stay abreast of the latest trends in preventive dentistry. Call us today at (508) 359-8004 to learn more!